Clear film only. 1.75 Mil 1-1/2" hole at top of bag. NOT AVAILABLE PRINTED. Size : 5-1/2x15" Packaging: 2000 per case Shipping Weight: 14 lbs. 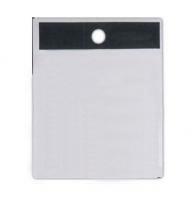 Self Protecting Auto Dealer Tag No imprint available Made in the USA. Size: W: 1-3/8" x H: 2-3/4" Imprint Size: 1-11/16" x H: 1-1/8" Packaging: Bulk Ship Weight: 500QTY/5LBS Carton Size: 16x12x12. A simple and neat way to package pens. Size: Approx. 5-1/2" Packaging: Bulk. 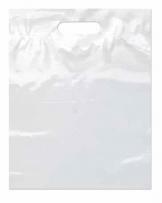 High-density 3 mil frosted translucent poly bags. Die cut handle. Minimum order is a case pack. Bag price is plain, please add for hot stamping. Prices shown are for BLANK, additional costs apply for decoration. Please call for details. Size : 9 x 12. Max. Imprint: 5 x 5. Case pack: 500 Case weight: 11. Plastic bags with cotton-draw string or plastic (poly)-draw tape. Bottom gusset on select sizes. U.S. prices are per bag and include 1 or 2 side imprint with 25% or less ink coverage. Minimum may be higher than 5000. Plate charges are additional. Please call for plate cost and production schedule. Bag Color Charges: Add $0.03 per bag for colors other than White or Clear. Size: 9.5W x 12H 1.75 mil. Plastic bags with fold-over die cut handles. Bottom gusset on select sizes. U.S. prices are per bag and include 1 or 2 side imprint with 25% or less ink coverage. Plate charges are additional. Please call for plate cost and production schedule. 4 Color Process Imprinting: For 4 color process imprinting, please call for pricing, delivery and minimum order requirements. Custom sizes and larger quantities are also available. Plastic material is recyclable. There will be an "eye spot" on corner of bag for converting purposes. Bag Color Charges: Add $0.03 per bag for colors other than White or Clear. Size: 9.5W x 12H 1.75 mil. Die Cut. Plastic bags with fold-over die cut handles. Bottom gusset on select sizes.  U.S. prices are per bag and include 1 or 2 side imprint with 25% or less ink coverage. Plate charges are additional. Please call for plate cost and production schedule. 4 Color Process Imprinting: For 4 color process imprinting, please call for pricing, delivery and minimum order requirements. Custom sizes and larger quantities are also available. Plastic material is recyclable. There will be an "eye spot" on corner of bag for converting purposes. Bag Color Charges: Add $0.03 per bag for colors other than White or Clear. Size: 9.5W x 12H 2.5 mil. Die Cut. Litter Bag - Fold-over lip front opening and 1" diameter hole. U.S. prices are per bag and include 1 or 2 side imprint with 25% or less ink coverage. Plate charges are additional. Please call for plate cost and production schedule. Bag Color Charges: Add $0.03 per bag for colors other than White or Clear. Size: 9W x 12H 1.75 mil. 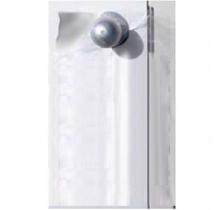 Door knob hanger bags, 1.25 mil. and single wall construction. 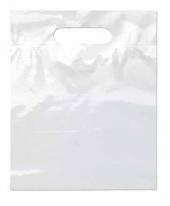 Size : 7" x 12"
Door Knob Bag - 1 1/2" diameter hole. Standard Pack-loose in box. Call for special packaging options. U.S. prices are per bag and include 1 or 2 side imprint with 25% or less ink coverage. Plate charges are additional. Please call for plate cost and production schedule. Custom sizes and larger quantities available. Plastic material is recyclable. Bag Color Charges: Add $0.03 per bag for colors other than White or Clear. Size: 5W x 15H 1.0 Mil. 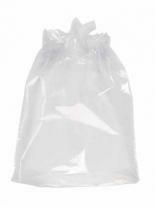 Plastic bags with cotton-draw string or plastic (poly)-draw tape. Bottom gusset on select sizes. U.S. prices are per bag and include 1 or 2 side imprint with 25% or less ink coverage. Minimum may be higher than 5000. Plate charges are additional. Please call for plate cost and production schedule. Bag Color Charges: Add $0.03 per bag for colors other than White or Clear. Size: 12W x 15H x 3 1.75 mil. 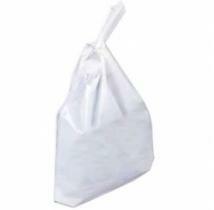 Litter Bag 9W X 12H - 1.75 Mil. Door Knob Bag - 1 1/2" diameter hole. Standard Pack-loose in box. Call for special packaging options. U.S. prices are per bag and include 1 or 2 side imprint with 25% or less ink coverage. Plate charges are additional. Please call for plate cost and production schedule. Custom sizes and larger quantities available. Plastic material is recyclable. Bag Color Charges: Add $0.03 per bag for colors other than White or Clear. Size: 7W x 12H 1.0 Mil. 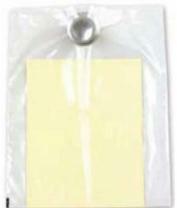 Door knob hanger bags, 1.25 mil. and single wall construction. 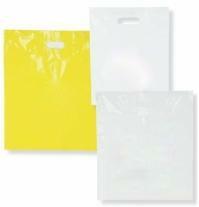 Size : 10" x 12"
High-density 4 mil (6 x 9 bag 3mil) opaque poly bags with die cut handle. Minimum order is a case pack. Full cases only. Bag price is plain, please add for hot stamping. Note: Please add color code to item number when ordering. Colors are an approximation of actual colors. 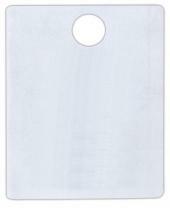 Size(wxdxh): 9\" x 12\" Max imprint: 5\" x 5\" Packaging: 500 per case Shipping Weight: 15 lbs. 1.75 mil white film. 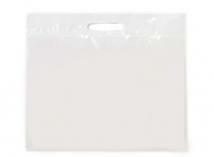 These versatile plastic bags come with a poly draw tape that acts as a handle while closing the bag at the same time. Each color and each side will need one plate (for example: a bag with 2 colors on 2 sides would need 4 plates). Bag price includes printing, up to 50% coverage. 20% over/underruns may apply. Size: 9"x13" Plate Charges: Machine Run Flexography up to 6 x 6 imprint - $75 over 6 x 6 imprint - $130 Packaging: 1000 per case Case Weight: 19 lbs. Plastic bags with fold-over die cut handles. Bottom gusset on select sizes. U.S. prices are per bag and include 1 or 2 side imprint with 25% or less ink coverage. Plate charges are additional. Please call for plate cost and production schedule. 4 Color Process Imprinting: For 4 color process imprinting, please call for pricing, delivery and minimum order requirements. Custom sizes and larger quantities are also available. Plastic material is recyclable. There will be an "eye spot" on corner of bag for converting purposes. Bag Color Charges: Add $0.03 per bag for colors other than White or Clear. Size: 12W x 15H x 3 1.75 mil. Die Cut. 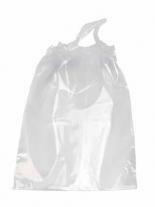 Litter Bag 9W X 12H - 3.0 Mil. Litter Bag - Fold-over lip front opening and 1" diameter hole. U.S. prices are per bag and include 1 or 2 side imprint with 25% or less ink coverage. Plate charges are additional. Please call for plate cost and production schedule. Bag Color Charges: Add $0.03 per bag for colors other than White or Clear. Size: 9W x 12H 3.0 mil. 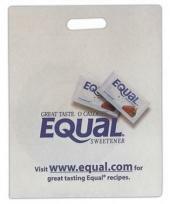 Custom Die Cut Handle Bags - 9.5W X 12H - 2.5 Mil. 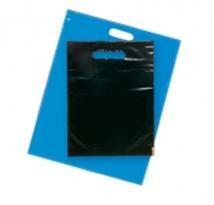 Custom Die Cut Handle Bags - 12W X 15H X 3 - 2.5 Mil. 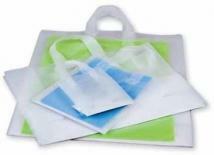 Plastic bags with fold-over die cut handles. Bottom gusset on select sizes. U.S. prices are per bag and include 1 or 2 side imprint with 25% or less ink coverage. Plate charges are additional. Please call for plate cost and production schedule. 4 Color Process Imprinting: For 4 color process imprinting, please call for pricing, delivery and minimum order requirements. Custom sizes and larger quantities are also available. Plastic material is recyclable. There will be an "eye spot" on corner of bag for converting purposes. Bag Color Charges: Add $0.03 per bag for colors other than White or Clear. Size: 12W x 15H x 3 2.5 mil. Die Cut. Imported 3 mil. 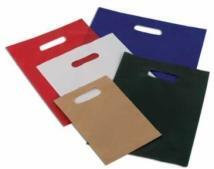 high density gauge shopping bags with 5" cardboard reinforced bottom gusset, Exceptionally strong square folded handles and wide gussets for large capacity and durability. 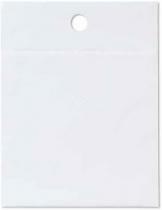 Size : 8" x 5" x 10"
Door knob hanger bags, 1.25 mil. and single wall construction. 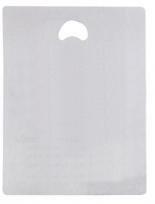 Size : 8" x 22"
Machine Run Program, 3,000 bag minimum. 1.75 mil film. PLEASE NOTE: Prices on machine run plastics are per bag with up to 50% ink coverage. 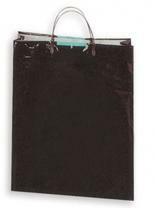 Call for information about bags with heavy ink coverage. Each color and each side will need one plate (for example: a bag with 2 colors on 2 sides would need 4 plates). 9 x 12 requires twice as many plates as larger bags. Bag price includes printing on 1 or 2 sides. Priced per each. Size(wxdxh): 9 x 12 Case Pack: 1000 Case Weight: 24. Machine Run Program, 3,000 bag minimum. 1.75 mil white film. Heavy gauge plastic patch reinforces handle area. Ideal for heavy items. PLEASE NOTE: Prices on machine run plastics are per bag with up to 50% ink coverage. Call for information about bags with heavy ink coverage. Each color and each side will need one plate (for example: a bag with 2 colors on 2 sides would need 4 plates). 9 x 12 require twice as many plates as larger bags. Size: 9" x 12" Plate Charges: Machine Run Flexography up to 6 x 6 imprint - $75 over 6 x 6 imprint - $130 Case Pack: 1000 Case Weight: 24 lbs. Door Knob Bag - 1 1/2" diameter hole. Standard Pack-loose in box. Call for special packaging options. 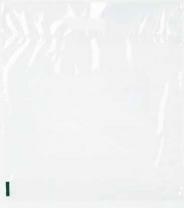 U.S. prices are per bag and include 1 or 2 side imprint with 25% or less ink coverage. Plate charges are additional. Please call for plate cost and production schedule. Custom sizes and larger quantities available. Plastic material is recyclable. Bag Color Charges: Add $0.03 per bag for colors other than White or Clear. Size: 10W x 15H 1.0 Mil. litter bag with single wall construction. Size : 10" x 12"
High-density 3 mil bag with cardboard reinforced bottom. Minimum order is a case pack. Full cases only. Bag price is plain, please add for hot stamping. PRINT CHARGES: Hot stamping (Foil) 250-$0.30, 500-$0.28, 1000-$0.26, 2500-$0.24 Plate Charges: Hot stamp $75 Size : 5" x 3" x 6" Max. Imprint: 3" x 3" Packaging: 250 per case Shipping Weight: 9 lbs. 1.75 mil film. 2" hole at top of bag, printing available on one side only. Requires double plates. Price per bag. Printed one side only requires double plates. Size(wxdxh): 9" x 15" Plate Charges: Machine Run Flexography up to 6 x 6 imprint - $75 over 6 x 6 imprint - $130 Packaging: 1000 per case Shipping Weight: 14 lbs. Imported 3 mil. plastic shopping bag with 4" bottom gusset, plastic clip on handles and cardboard reinforced top and bottom and single wall construction. Size : 8" x 4" x 10"
1.75 mil white film. These versatile plastic bags come with a poly draw tape that acts as a handle while closing the bag at the same time. 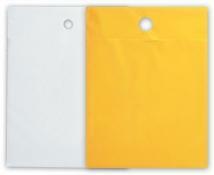 Each color and each side will need one plate (for example: a bag with 2 colors on 2 sides would need 4 plates). 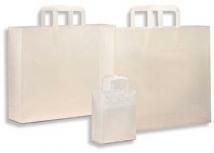 Bag price includes printing, up to 50% coverage. 20% over/underruns may apply. Size: 12x16"x4" Plate Charges: Machine Run Flexography up to 6 x 6 imprint - $75 over 6 x 6 imprint - $130 Packaging: 1000 per case Case Weight: 19 lbs. Plastic bags with cotton-draw string or plastic (poly)-draw tape. Bottom gusset on select sizes. U.S. prices are per bag and include 1 or 2 side imprint with 25% or less ink coverage. Minimum may be higher than 5000. Plate charges are additional. Please call for plate cost and production schedule. Bag Color Charges: Add $0.03 per bag for colors other than White or Clear. Size: 15W x 19H x 3 1.75 mil.